Wing Hanno Dirksen has signed a new three-year Ospreys contract keeping him at the Liberty Stadium until the end of the 2016-17 season. He has been signed up ahead of the region's final RaboDirect Pro12 clash of the season with Connacht on Saturday. Dirksen, 23, is the 13th player to re-commit to the region along with the likes of Alun Wyn Jones and Dan Baker. "I'm very, very happy to have another three years," said Dirksen. "I haven't had much game time this year because of a long injury, but I'm back playing again. "The region has been very good to me. It's where I've developed as a rugby player and is home for me, which makes it even more special to stay here." Born in Krugersdorp, in the Gauteng province of South Africa, Dirksen arrived at the Ospreys as a teenager, via the United States and Cornwall. His family moved to the US in 2006, where he represented the national team at age-grade level, and played in an uncapped match for the senior team against Munster in the summer of 2008. He then made a huge impression in the Welsh Premiership with Swansea, scoring 21 tries in 22 games, making his Ospreys debut in November 2009. 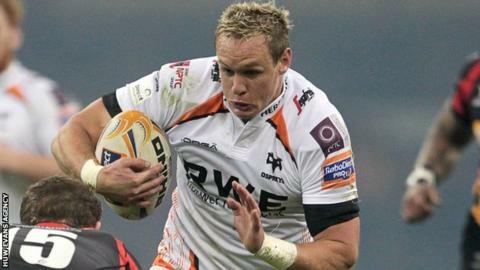 Ospreys rugby operations manager Andy Lloyd said Dirksen's physical approach to rugby was impressive. "He has a real physicality, a forceful nature to his game, and a 'go-forward' attitude that can be crucial to how we want to play the game as a team," he said. Dirksen's signing comes on the back of speculation that Wales lock Luke Charteris could join the Ospreys as he is likely to leave Perpignan along with James Hook after the French club's relegation from the Top 14. Charteris would be viewed as an ideal replacement for the Ospreys' Toulon-bound second row Ian Evans. Among the other players to sign new contracts are: Sam Lewis, Ashley Beck, Jonathan Spratt, Ben John, Ryan Bevington, Dmitri Arhip, Nicky Smith, Dan Suter and Lloyd Peers. As well as that the region have recruited Josh Matavesi, Rynier Bernardo, Dan Evans, Sam Parry and Gareth Thomas.